With Valentine’s Day just around the corner, this blog is all about THE LOVE! Since last years’ wedding season was our busiest yet, it’s only fitting that I had tons of wedding elements that I loved! 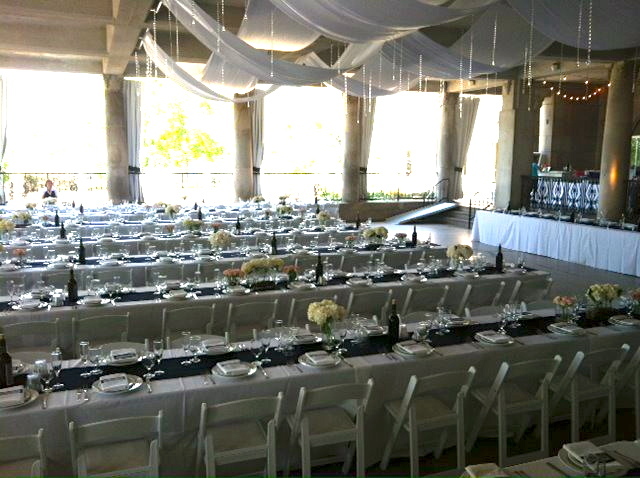 All weddings we see at The Veranda are entirely different and distinct from one another – seeing all sides of the wedding spectrum! My Love List compiles my favorite wedding elements from our 2012 season that will lend a hand in creating a perfectly unique wedding celebration of your own! I think I speak for the entire staff who was a part of the behind the scenes on this wedding day that we had never seen anything like this before! So stinking cute! Couples are always looking to give their guests some entertainment during the wedding reception and this was a great idea! How could this not be a unique wedding? 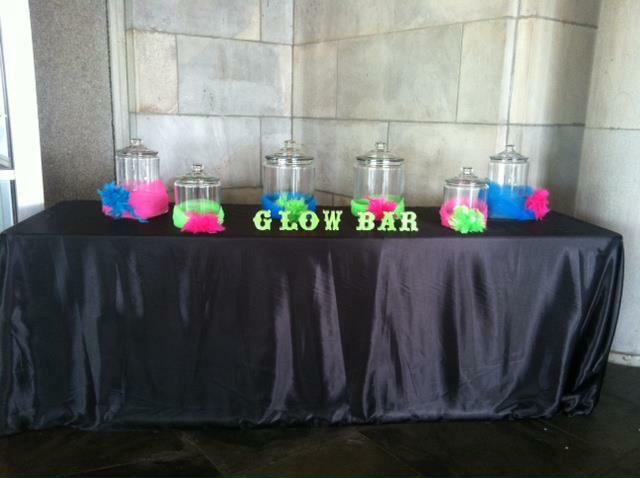 Once the sun went down and guests moved to the dance floor, the glow bar came to life with every possible glow stick-esque piece you could think of! 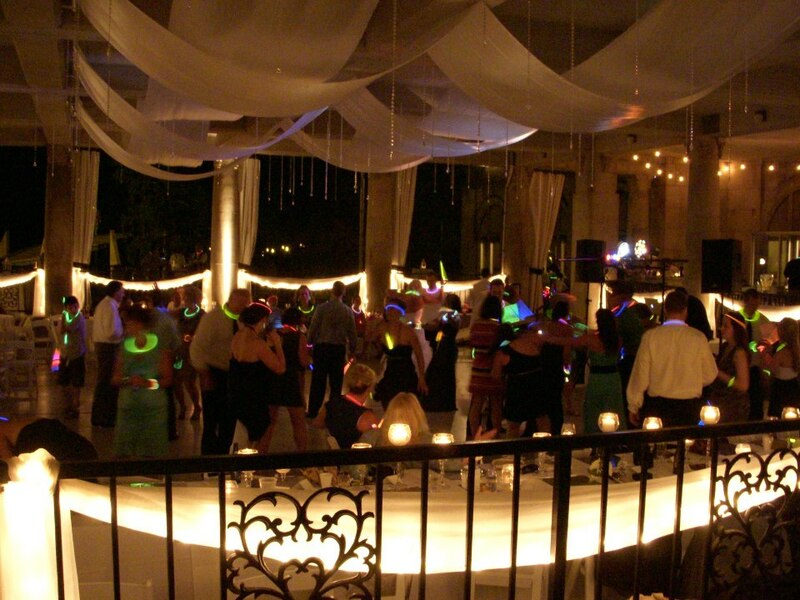 Glow sticks, glow necklaces, glow rings, glow earrings, glow bracelets, the list goes on! The dance floor was packed the entire night! This and the awesome DJing of Music Express Mobile DJ Service had to be one of the many reasons why! We had a ton of weddings in 2012 that decided to do a spin on handing out favors and instead donated money to a charity or association that meant a lot to them. Among those were the ALS Association and the Michigan Charity for Aicardi Syndrome. Since wedding favors aren’t always keepsakes, they chose to instead use that money to go towards amazing causes. This is not only a unique wedding but an inspiring one as well. A couple who is willing to take a chance and push the envelope with their reception layout is going to have a unique wedding reception, guaranteed. Seating arrangements can be a very important element in the planning process and because of their willingness to take a chance, the layouts came out spectacular and was a non-traditional way for guests to mingle! As a dog lover myself, I thought it was so adorable that we had two on-site ceremonies in 2012 (both in the same weekend nonetheless) that decided to incorporate their dogs in the ceremony! This was such a great way to personalize the ceremony and involve their dogs on such a special day! This unique wedding idea wouldn’t have been complete without the floral headbands and collars that decorated each of the pups! That’s right, I said it… puff ball décor. Such fancy lingo, I know! 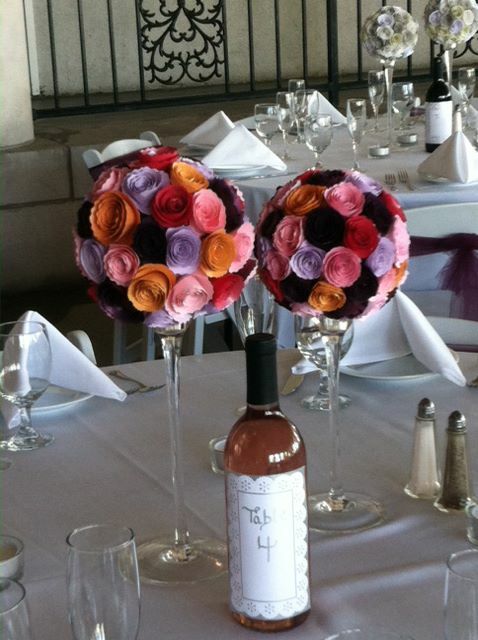 These were such a great statement piece above the head table at this 2012 Veranda wedding. 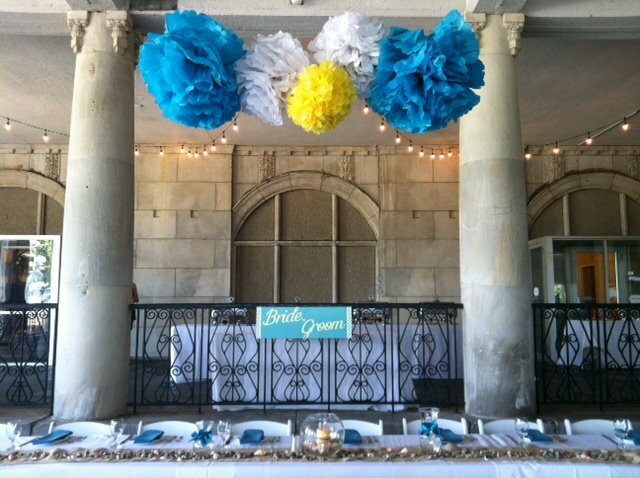 This was such a unique wedding and the puff balls added a perfect touch and pop-of-color! These puff balls are also a great DIY project that is inexpensive and beyond simple to make! Check out how to make your own DIY Puff Balls here courtesy of AllMyWeddingFaves! I think these pictures say it all! 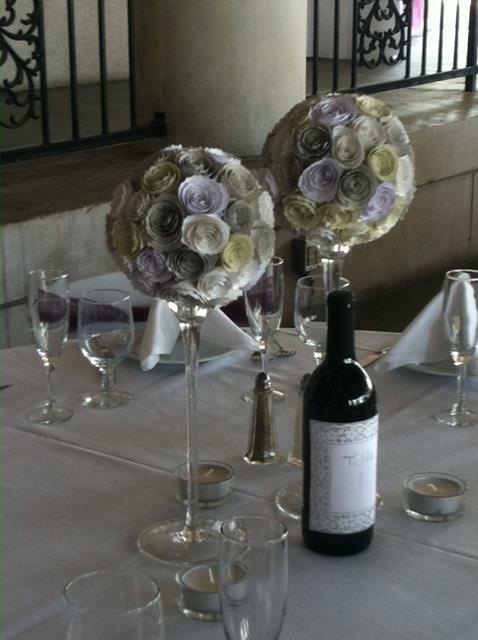 This couple handmade 28 paper floret balls together for some of the most beautiful, talk-worthy, and unique wedding centerpieces I think we’ve ever had at The Veranda. 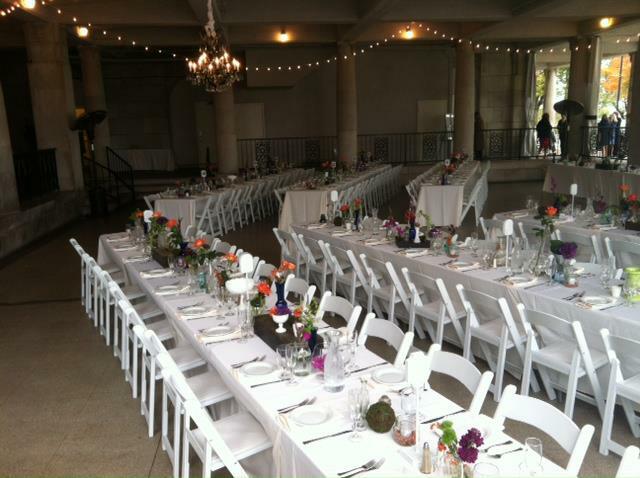 They even made a special white-tone version for the head table! Hats off to them for the patience and time I’m sure this took! I think at the end of the day, it was well worth it and the statement it made! There were so many memorable weddings we had in 2012 and it makes me look so forward to seeing firsthand what our 2013 brides come up with!